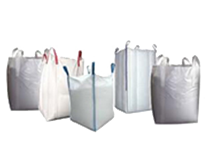 We manufacture& Supply Polypropylene Fabrics, Polypropylene Bags, Bulk Bags, Sand Bags, Block Bottom Valve Bags, FF&S Bags, Geo Bags and BOPP (Biaxial Oriented Polypropylene) Bags. All products from Dayana are extensively used for packaging goods like Sugar, Foodstuffs, Fertilizer, Mineral, Chemicals and Plastic Granules. Our Bags are available in various standard specifications with high transparency, durability, clarity and excellent tensile strength with beautiful and clear prints embossed on them. Our cost-effective BOPP pouches are made of food grade quality and hence also best suited for the food and beverage industry. Our stringent quality measures ensure world-class quality at every level and reflect our commitment to provide better productsthat lead to high levels of client satisfaction. The image displays Type "C" Bags with Top Filling Spout and Type "D" Bagswith Bottom Discharge Spout. Type "D" and Type "E" Bag display the Top "SKIRT" also called Duffle. Type "G" Bag comes with "FLAP" as displayed in the image.